This video brought to you by Sad Shibow, who is not in tune enough with her audience to know whether or not it will get the reference in the title of this post. Also… guys, it’s an excellent song. This week has been a little bleh so far. The most exciting thing that’s happened is that someone made fun of my hair today and I cried over it. So basically the most exciting thing that’s happened all week is that I’ve regressed emotionally into early, early, childhood. Let me just totally not bother you with that and skip right to the dessert chat, yeah? So a bunch of people asked me if I’d be making soda bread for this week’s post. No, because a. already owned that shiz, b. all of the drunken revelers at this year’s parade– held annually on the avenue directly in front of my place of employment– killed my vibe and c. THAT’S TOO OBVIOUS, HOMIES! 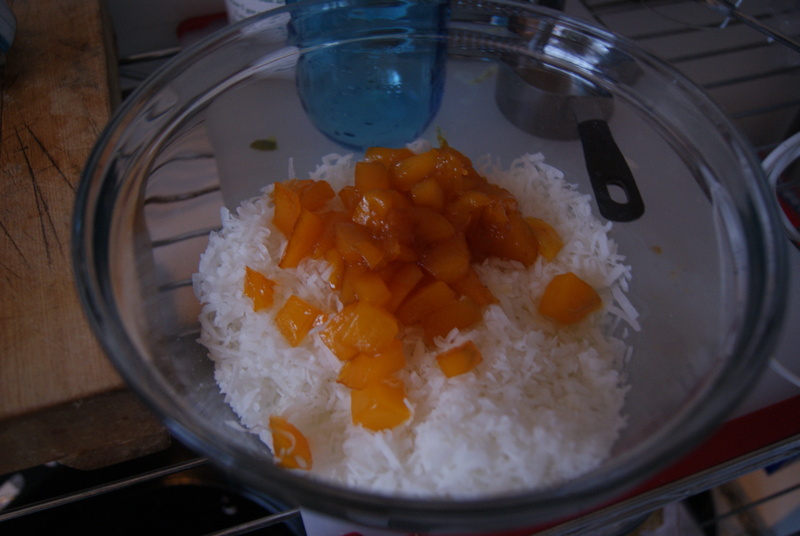 Also, d. I was making this dessert for my mom, for whom I stereotypically decided to make a mango dessert because she is Indian, and also because she genuinely loves mangoes. Anyway, I hadn’t seen her in far too long to be considered acceptable, and thought that a sweet treat was just the right form of bribery channel through which to express my my-bad’s. 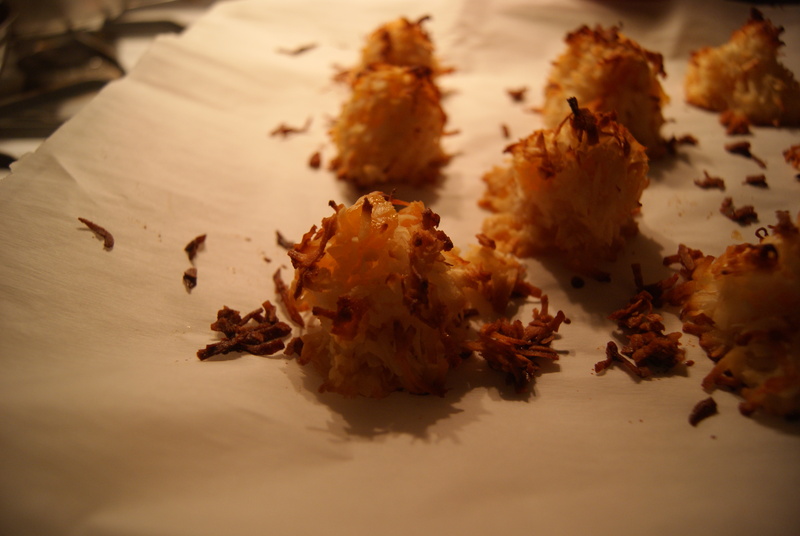 Enter Mango Coconut Macaroons, an easy, delish, fancy looking (and fancy tasting) treat. 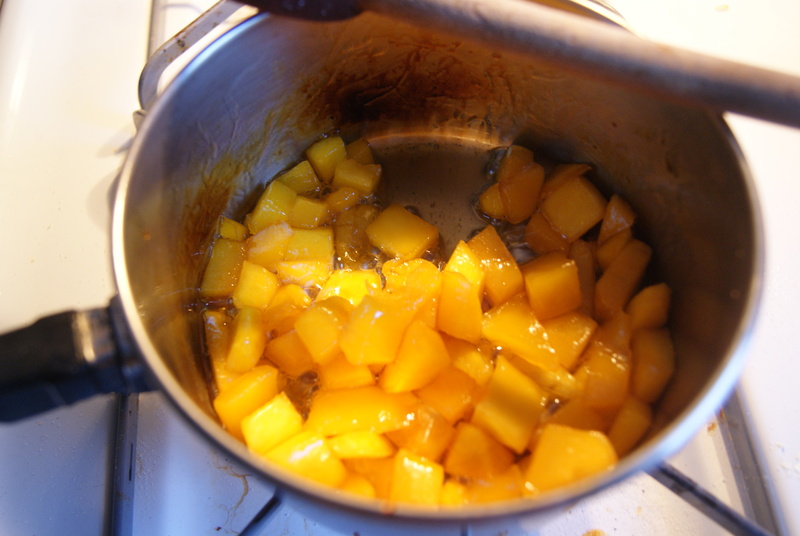 Cook mango chunks (sprinkled with sugar, if you desire) in a small saucepan over medium heat, stirring until frequently, until the mixture has cooked down into soft clumps. Set aside to cool. In a large bowl, combine coconut and egg whites, then stir in mango chunks until batter forms. The mixture will be sticky and probably a little annoying to deal with, so it’s a good idea to use an electric mixer in this case. Preheat oven to 350ºF and line a large cookie sheet with parchment paper. With buttered hands, gather tablespoon-sized mounds of the batter and form into balls or pyramids. I tried to go for something more abstract, because I just could not get either of those other damn shapes down for the life of me. Bake for 30 minutes, rotating the pan halfway through, until the tops of the cookies are browned. Let cool for at least ten minutes, then enjoy. So, what’s the verdict on these? Given that I, like my mother, am Indian and have no interest in subverting the stereotypes of my culture, I freaking loved them. 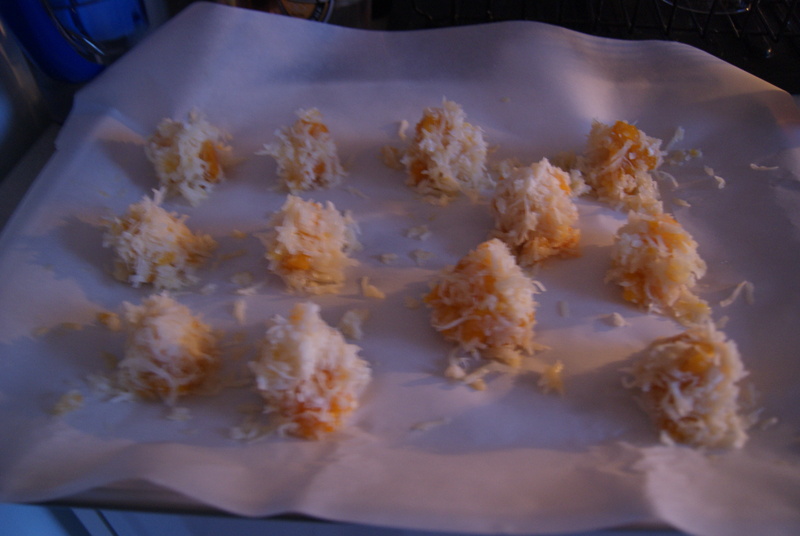 They’re MANGO COCONUT macaroons. More importantly though, my mom was enamored with them. Even my dad ate two of them. Two! I mean, one I can understand, as he’ll do anything to make my mom happy. But two? He likes ’em! He really likes ’em!